This clip is taken from the 60-minute video, Raphaël Confiant Speaks, produced by Mosaic Media Arts and videotaped and edited by Full Duck Productions. The video presents a lecture Confiant gave at the International Conference of Caribbean Literature held in Martinique in November, 2001. The prolific French Caribbean writer from Martinique, who writes in both French and Creole, gave this keynote speech in which he describes his evolution as a writer, his passion for Creole culture and issues of French writers. This video was videotaped and edited by Full Duck Productions and produced by Mosaic Media. 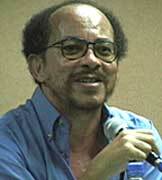 The video presents a lecture given by Raphaël Confiant as the Keynote Speech at the 4th International Conference on Caribbean Literature, Trois-Ilets, Martinique, November 7, 2001. Confiant describes his evolution as a writer, his passion for Creole culture and the history of the literary movements of Négritude, Créolité and Antillanité. He also addresses the current preoccupations of contemporary French Caribbean writers, including his own. Challenge: Videotape a speech given in a crowded room without an opportunity to set up lights or the stage. Videotape only people in the room who have given their permission. Keep continuity and record every word with one camera. Solution: Full Duck obtained permission from the speaker to videotape the speech. Then Full Duck requested of the house management that the lights be turned on high and set the camera on a level above heads in the crowd. Full Duck used a combination of wide shots of the stage and closeups of Confiant, moving the lens slowly and carefully in anticipation of not having appropriate cutaways to edit the program. Excellent blog here! Also your sitye load up very fast! What host are you using? Can I geet your affiliate link tto your host? Hi, Thanks for your comment! My service is WordPress.com and my theme is Suburia. I don’t know what makes it load as well as it does. I don’t really blog just upload information about my services. My front page is static. Any videos on the site are actually on YouTube and just linked to them. People seem to like the site’s simplicity. It is mostly organized around the first 7 videos which I have for sale. The other ones on the page are simple a sampling of the projects I have done. It works as a sales vehicle, resume and question-answerer for me. This entry was posted on May 30, 2014 by Full Duck Productions in Ethnic Expressions and tagged Raphael Confiant.